The textile bag which I started earlier is now complete! I'm really happy with the result. It turned out just like I thought it would be. And more than that, I ended up adding some unexpected touches – like the buttonhole edging with bullion picot, which has a lovely “lacy” look. And today I'm sharing a how-to on this stitch. 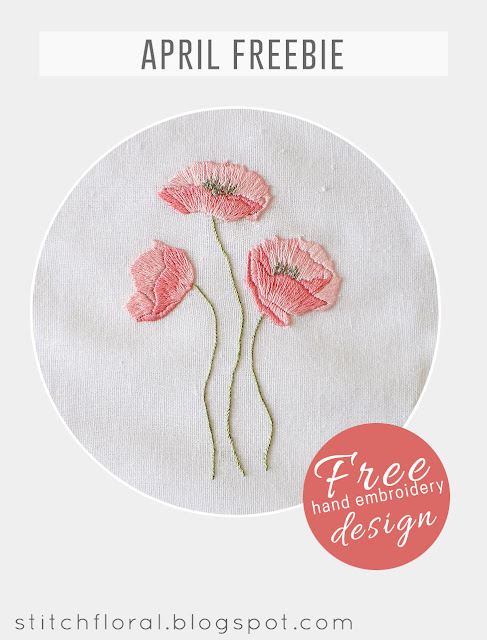 Dancing poppies: hand embroidery freebie! 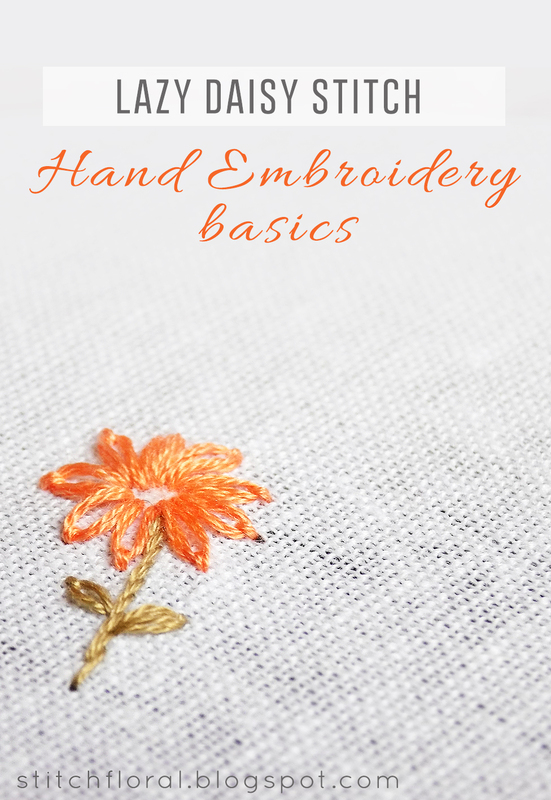 I'm super excited to share this free hand embroidery design with you! Dancing poppies is one of my most favorite patterns that I developed myself. It was supposed to be matching with the Yellow poppies wreath, but somehow in the middle of stitching, it just got its own character and mood. 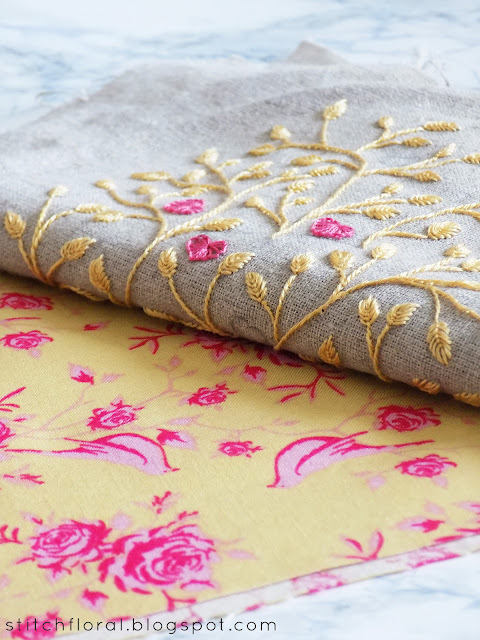 It is much more delicate and tender and fits perfectly for the spring stitching season! Recently I made an inventory of my fabric stocks and once again realized that I have to do something with the pile of rather small scraps. They are left from the days I was into patchwork. 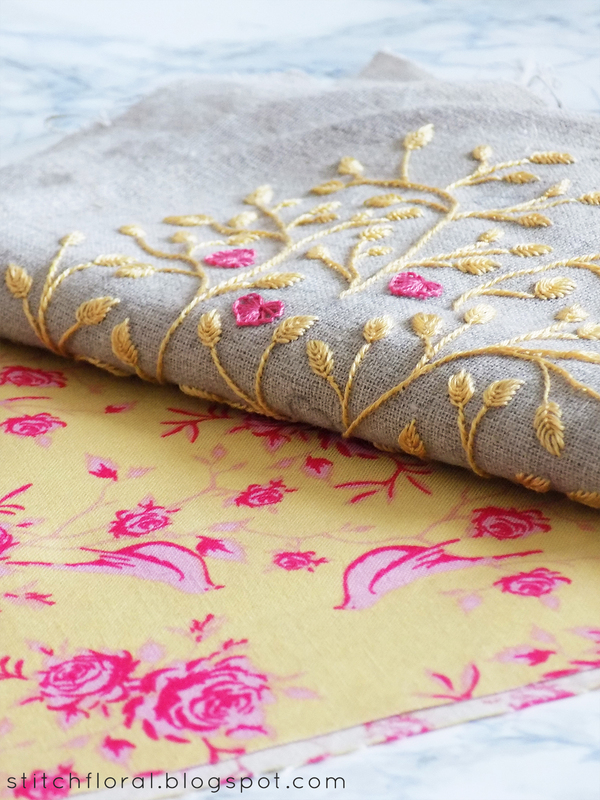 My passion for it faded away, but the fabric is still taking place in the drawers. So, I decided to make a challenge for myself – to get rid of all the fabric by making some useful stuff! Naturally, featuring hand embroidery. The first product of this challenge is going to be a textile lunch bag! This week I already posted twice about stitches, so I thought why don't I finish it on a similar note? I consider lazy daisy stitch and chain stitch as relatives, so it was easy to pick a new stitch for today: the most logical candidate would surely be fly stitch! That will make the family complete. 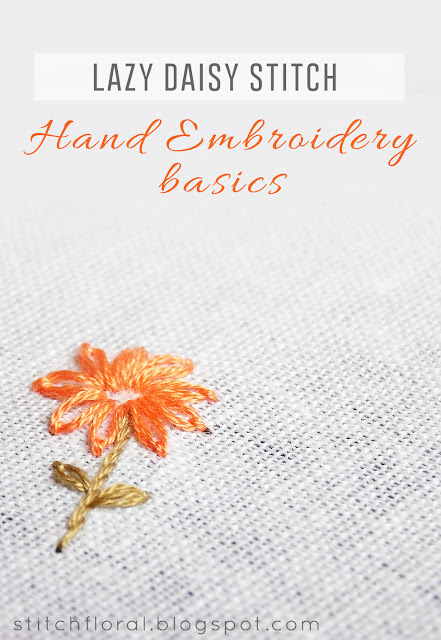 Another one from the list of essential hand embroidery stitches. As you may guess by the name, this stitch resembles a chain. However, there's more to its looks and variety. Today I'm going to cover the chain stitch, reverse chain stitch and broad chain stitch. Is spring coming in the place where you live? It is so late here. It was snowing today! 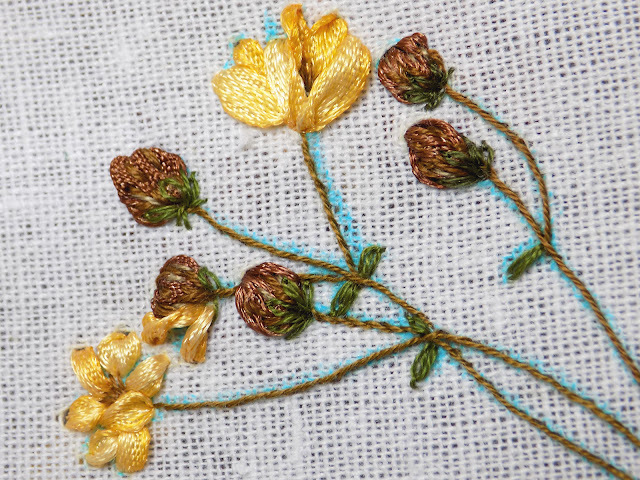 I'm so impatient for the bright colors of blossoms and greenery of grass, so today I decided to cover one of the most common stitches for embroidering flowers. Lazy daisy stitch, that is. This is one of the basic stitches in hand embroidery and you can meet it very often in all kinds of works. 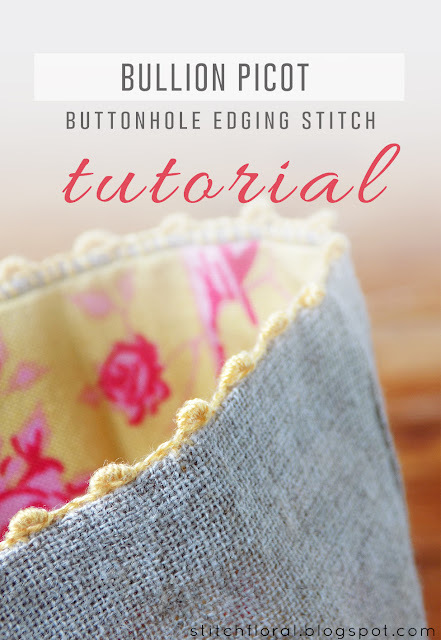 I love it because it's really easy and is super handy when you want to stitch cute floral thingies! First things first, let's try making one! 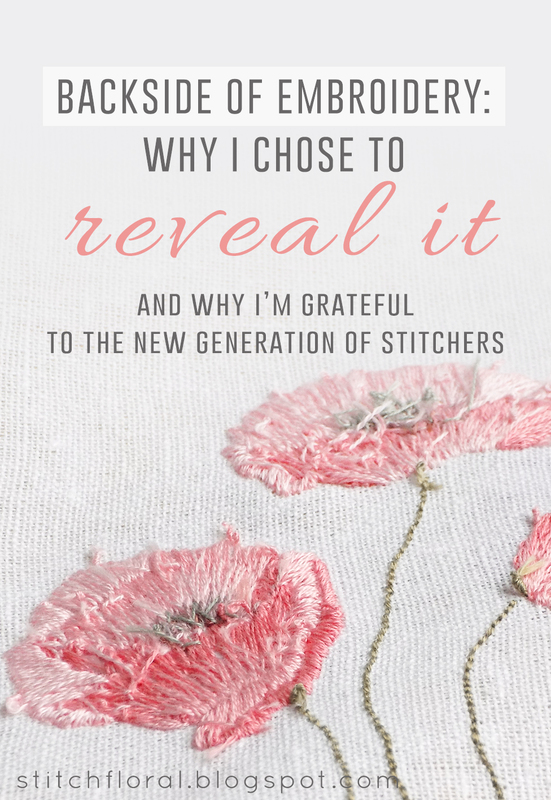 Let's talk about the backside of hand embroidery and the “revolution” that is taking place right now. If you are a beginner in this craft, you may not know about how much of a stumbling block it used to always be in its world. If you are experienced, you probably watch the changes, contemplating on what effect they are going to bring. 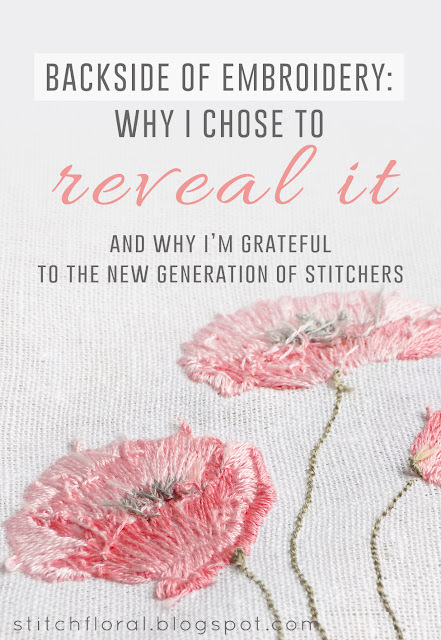 But the fact is: with the new generation of stitchers the attitude to the backside of hand embroidery is undergoing massive changes. So, how did the “messy” backside turn from something disgraceful to something artful? What exactly is the role of the new generation in our craft? 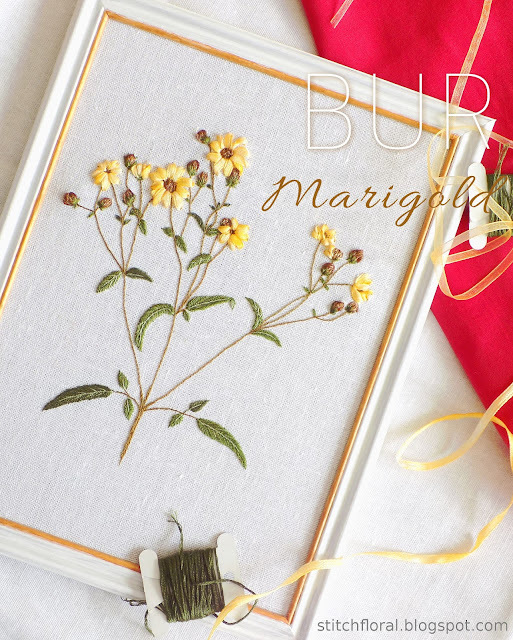 Bur Marigold – project complete! If you've been following the recent posts in the blog, you probably know that I've tried my hand at embroidering a botanical print of a wild herb called Bur Marigold. The piece is finished now and rejoices me with its vibrant sunny colors! After finishing with the lower part of the plant, it was the turn of the flowers and their buds. I decided to include ribbon embroidery in this piece because I wanted to achieve more realism in the final look of the work. Usually, when you open a book on hand embroidery, the first thing you see is the "theory" part: how to choose fabric, needle, and thread. Naturally, it is very important! But as for me... 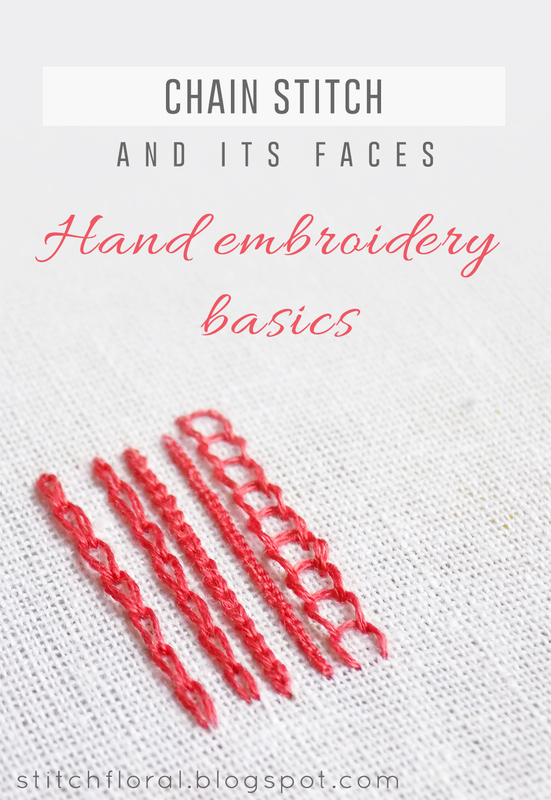 I think if you want to start hand embroidering the first thing you need to learn is how to start your thread and get going. 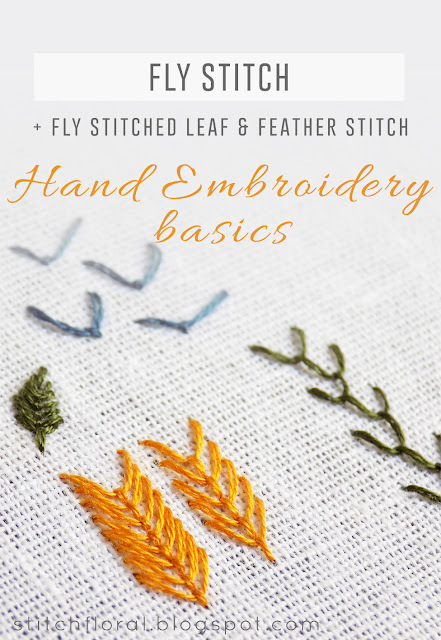 Because you can get quite a good grasp on which fabric and needles are better already in the process. That's why I prefer starting with practice and polishing my experience and knowledge with theory later. 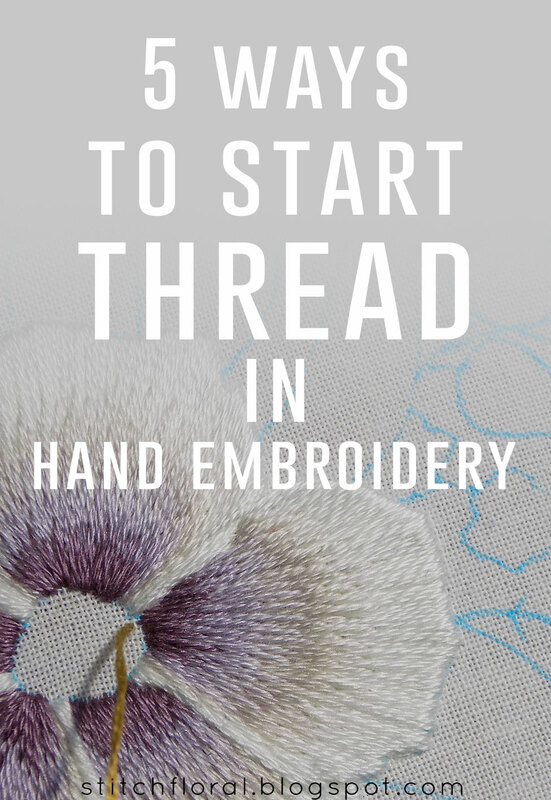 So, take a needle, thread and a piece of fabric (this will be a practice session so I wouldn't recommend using anything too fancy, though) and let's start. I have to admit that floral wreaths are my weakness. I have a wreath of yellow poppies and the latest one - white anemones with blueberries. 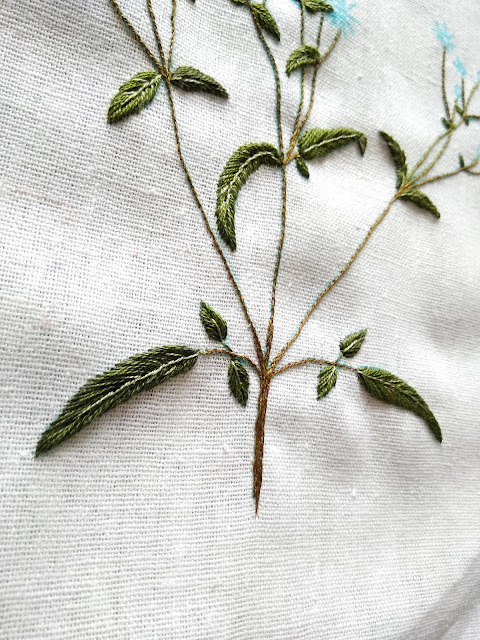 But recently I decided to try myself at stitching a true botanical print. "Winter Joy" - a lovely floral wreath with white anemones. Status - complete! This is my most favorite wreath among the ones that I've stitched so far. 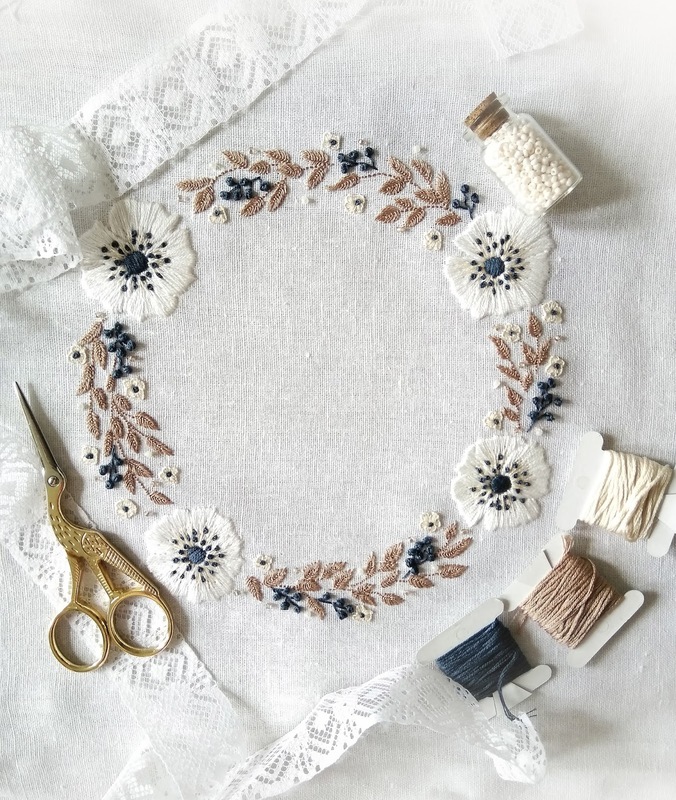 White anemones, blueberries that perfectly match the centering of the flowers, leaves motif, petite blossoms and beads to add more dimensional variety to the work.